The Low Location Lighting Systems are to be fitted to the wall and skirting surfaces to communicate a clear, unambiguous, continuous means of escape message, right through to a place of safety. The benefits of this system is it is extremely easy to see in the event of an emergency evacuation. It is a cost effective solutions when compared to hard wired emergency lighting, which requires a constant source of electricity to power it. The product provides instant activation upon failure of the normal lighting where as some non maintained electrical hard wired systems can take up to 15 seconds to activate in the event of an emergency, time which could be critical in the safety to the occupants of a building. 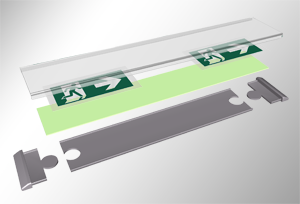 The system comprises of a high tensile PVC profile that is mechanically fitted to the wall and skirting surfaces, into which photoluminescent material and appropriate signs can be easily clipped into position in order to complete the system. 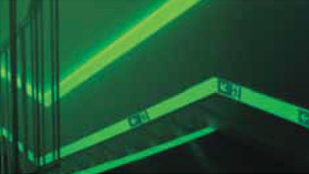 JALITE offer two different lighting solutions, in the form of the Low Location Lighting kits, and Stairnosing which can be combined in order to provide an extremely efficient aid in the means of escape. Details on how to order the products, with instruction on how to fit are available, along with a wide selection of other JALITE products.